Free Bonus Receive $20 deposit bonus on your first deposit. Promo Requirements New user sign-up and $5 minimum deposit. Free Entry Vouchers New users also receive entry voucher to an NFL contest. Play Until You Win FanDuel will give you a voucher until you get your first NFL "Play Til You Win" contest win. FanDuel offers a couple different promotions across its entire suite of product and services. Currently there is only one welcome bonus available to new users. Their welcome bonus is a Deposit Bonus for new customers and requires NO PROMO CODE. 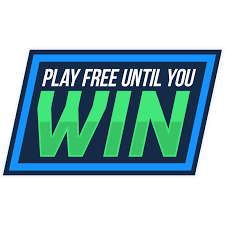 Another welcome gift for new users who sign-up at FanDuel is a free “Play Til You Win” vouchers to enter a paid NFL contest. Not only is your first NFL contests on them, FanDuel lets you replay that same sport until you get your first win. The table above briefly describes the FanDuels’ welcome promotions: deposit bonus, play until you win vouchers and the FanDuel Players Club loyalty program. Below we will go into further details on each of the promotions. 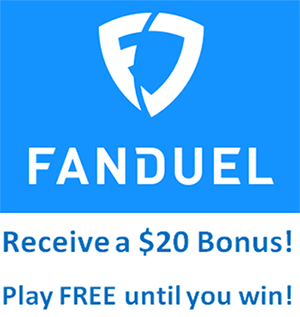 New users that register a FanDuel account will be eligible to receive FanDuel’s $20 Deposit Bonus. The bonus is for new users who make a deposit of $5 or more. The Play Bonus is paid out as a $20 bonus play. The deposit bonus is added to your account and must be used to enter contests. This means that the bonus cannot be withdrawn from your account, only used to purchase entries into paid contests. You can turn these free entries into money prizes. You have 21 days to use the bonus or it will be lost. When you sign-up for a new account on FanDuel you will automatically receive a free “Play Til You Win” voucher to an NFL contest. Just by signing up for an account, FanDuel gives you an opportunity to win money prizes. These vouchers require no deposit and no promo code. Make sure to check your notification or Vouchers page to find out the expiration date. The NFL “Play Til You Win” Voucher expires 12/31/2018. 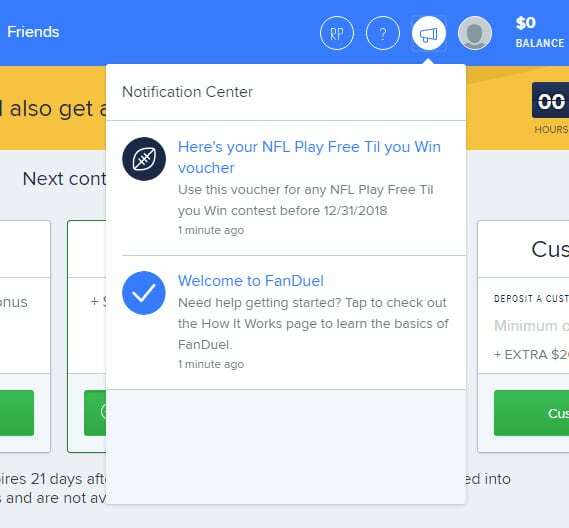 If you didn’t win a money prize in your first NFL “Play Free Till You Win Contests,” FanDuel will give you another “Play Free Till You Win Contest” voucher to that same sport (You will get your vouchers usually the following business day). FanDuel will continue to send you vouchers until you get a win in that sport. That means guaranteed prize money just for creating an a FanDuel account. 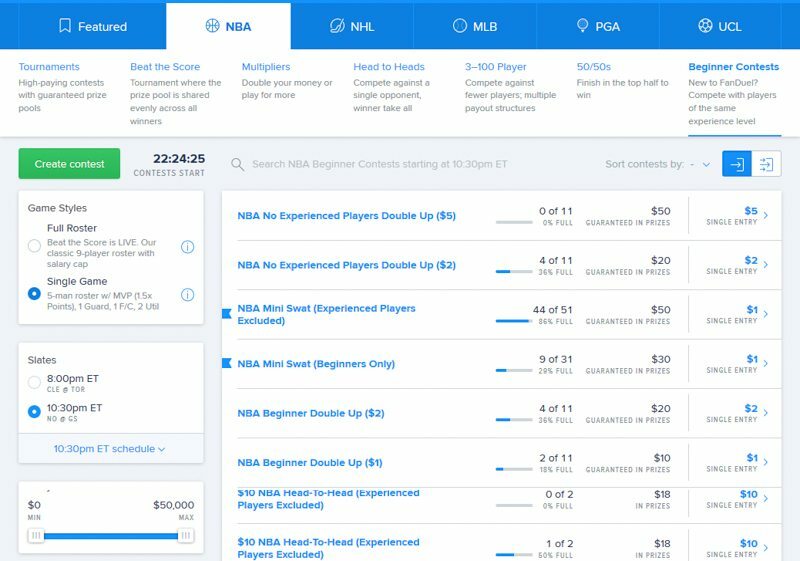 If you’re new to daily fantasy sports, this is one of the best ways to get your feet wet as FanDuel will reward you with money prizes as long as you put the effort to create a winning team. Not only is there no risk in entering these free contests, it’s basically stress free to win money as FanDuel will give you multiple attempts until you do. 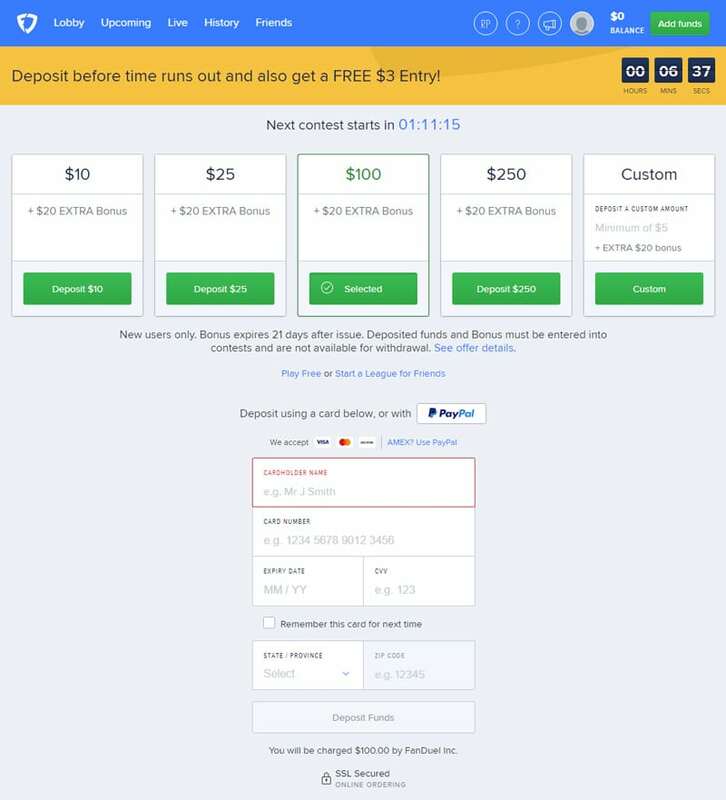 To create your FanDuel Account it is straightforward. All you need to provide is your Full Name, Email, Screen Name and Password. You can leave the promo field empty. Once you are done you can click on the “Play Now” button. This will also mean you accept FanDuel’s Terms & Policy. So make sure to read their Terms & Policy pages. Your account is now created and you will receive your a welcome voucher to an “NFL Play Free Til You Win Contest”. That’s all there is to it to start winning free money prizes from FanDuel. Once your FanDuel account is created, you can receive FanDuel’s bonus deposit by making an initial deposit of at least $5 into your account. When you make a deposit you can choose $5, $25, $100 or $250. If you want to deposit a different amount, select “Custom” and enter your desired amount. To help show your bonus deposit easier, FanDuel reminds you that you will receive “+EXTRA $20 Bonus” if your $5 or more deposit, is your initial deposit. After you selected your desired amount, you must fund your deposit from a credit card, debit card or PayPal account. Your choice of credit cards include Visa, MasterCard and Discover. If you prefer to use your American Express you do that through PayPal. You can also fund your FanDuel account by using PayPal balance or bank accounts you set up on PayPal. Once you fill out your payment info, select “Deposit Funds”. Your FanDuel account will be credited once your payment has been confirmed. You will also receive your deposit bonus in the form of free play, this must be used within 21 days or they expire. If you’re interested in other ways of earning free plays, read the next section to learn more how earn more FDPs and how to use your FDPs to purchase entries into paid contests. 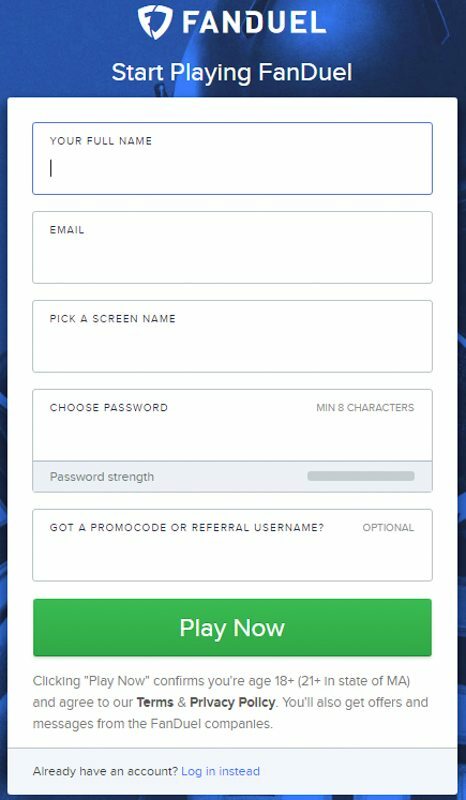 FanDuel rewards it’s users through the FandDuel’s Players Clubs. This loyalty program rewards you when you enter a contest. Everytime you pay a entry fee you will earn FanDuel Points. 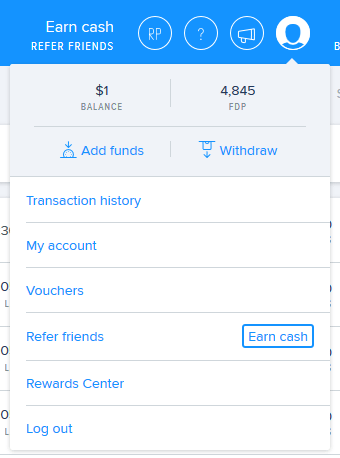 Whether you enter a lot of low entry fee contests or a few high entry fee contests, you can quickly earn FDP as it is based on the total amount you spent on entry fees. As of writing, you earn 5 FDPs for every $1 you spend on entry fees. If your entry fee for a contest is $10, FanDuel will give you 50 FDPs to your account. Just a reminder, your FDPs will expire if you are not active earning FDPs for one year. But once you start entering paid contest, you will see how easy it is to have fun playing. Once you have accrued enough FDPs, you can use your points to fund your payment for a paid contest. That means the free FDPs you earned, gives you another chance to win free money by entering a contest of your choice. To pay using your FDP balance instead of from your account account balance, you will choose that before submitting your roster. When you enter a contest of your choice, you can fill out your lineup as usual. Once you are ready to submit your roster you will see a blue link that lets you enter using your FDP, showing the total FDP needed. This will be right next to the green “Enter” button. FanDuel offers you daily fantasy sports contests that gives you a chance to win money prizes. Similar to fantasy leagues, you select a roster for a particular sport of your choice. 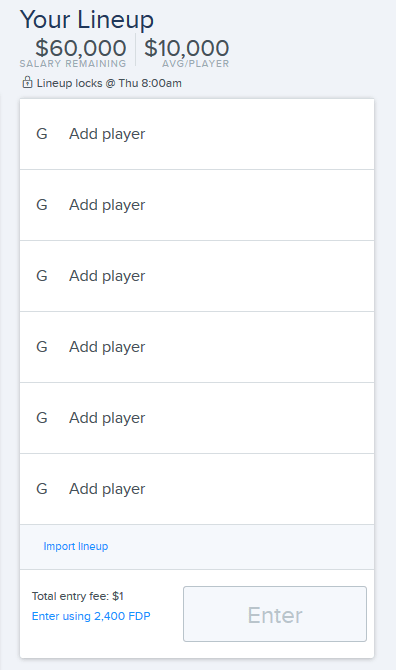 Depending on the scoring system and games available for that day, you will assemble your roster of available players that you believe will give you the most points. If you place in the winners’ prize bracket you will receive cash prize to your account once the contest is over. When you go to the FanDuel Lobby, you can choose the contest that best fits your expertise. From the Lobby you will first select your sport of choice: NFL, NBA, NHL, MLB, PGA, etc. Then you can choose the contest type: Tournaments, Beat the Score, Multipliers, etc. Contest type will have different scoring rules, also the types of positions you select to fill your roster and the percentage of people who can place for a cash prize. Once you start playing, you will find out which contest type you prefer to give you a better chance of winning. Some of the important factors to consider when choosing a contest is entry fee, players who already entered, number of entrants, single or multiple entries asllowed, prize payout and games/players eligible. That’s all there is to get started, so Sign-up for FanDuel today! Find the latest FanDuel promo codes at http://bettingsitesusa.net/fanduel-promo-bonus/ courtesy of BettingSitesUSA. Hedge your fantasy lineups with sports bets! We recommend visiting http://williamspromocodes.co.uk for the latest free bet promo code offers.